On the back of two recent good runs in group races, NOVA STRIKE was on target when he captured the Group 3 S$200,000 Moonbeam Vase over 1600m at Kranji here today. It was his second group success after winning the Colonial Chief Stakes at the tail-end of last season. Back in May, NOVA STRIKE was the top local finisher when third behind Hong Kong's SOUTHERN LEGEND and HORSE OF FORTUNE in the Group 1 Kranji Mile. Two runs later, NOVA STRIKE was back in the winner's circle for his 10th win in 45 starts in the 1600m event today. "I’ve just been waiting for this race for Nova Strike. 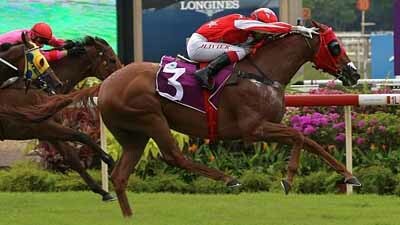 He’s a top class horse, and it’s very hard to find a race for him,” said trainer Alwin Tan. "From the way he won today, he can definitely run over longer distances," said jockey Oliver Placais who rode him the last four starts for two placings.